This time I had a short trip to Madan. I started directly from Munich, on Monday, directly after the Munich Show. 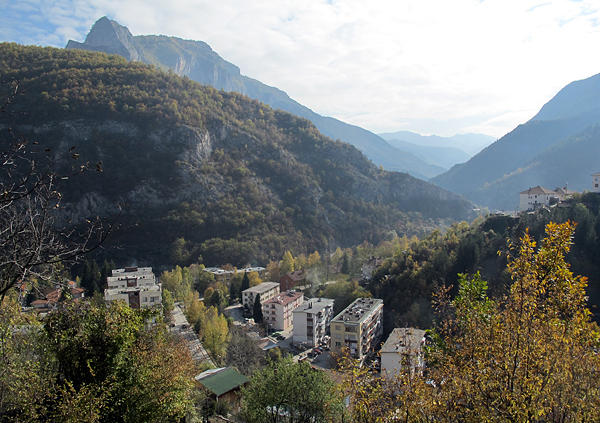 I flew to Greece and from there drove to Madan. Unfortunately, this time Asia didn`t have time to join me, therefore the photos are not as good as we used to have in our previous reports. I also didn`t have much luck to see and collect pockets in situ. 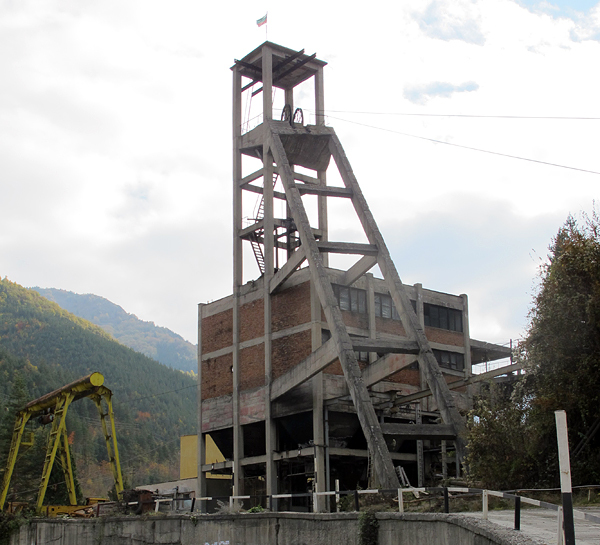 However, the visit to Borieva mine and the new finds in Krushev Dol and Borieva encouraged me to write this short report. 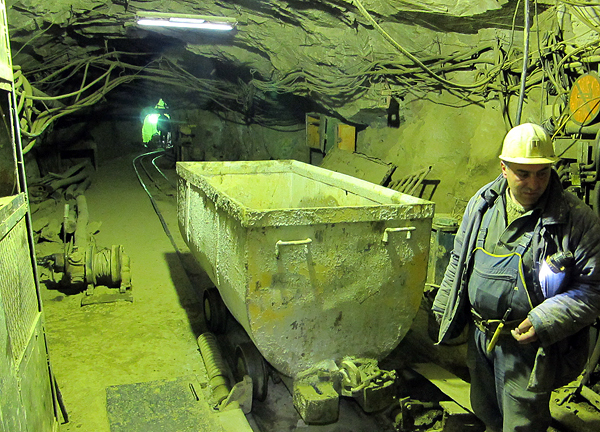 The main target of my trip was the visit to Boriva mine, which I never visited before. 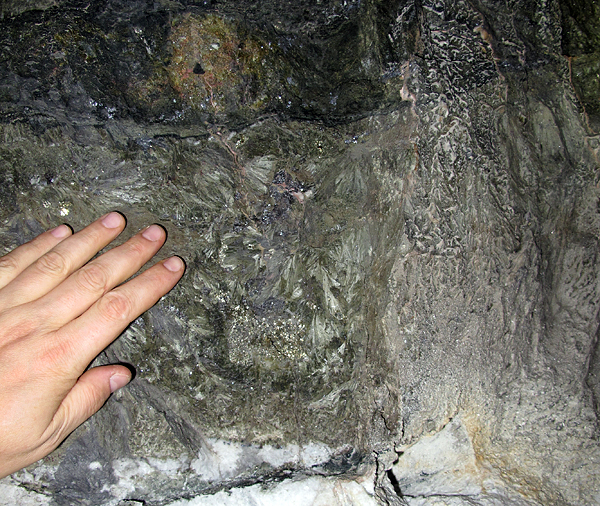 A very interesting feature is presence of pegmatite bodies contacting with metasomatic zones and marbles. 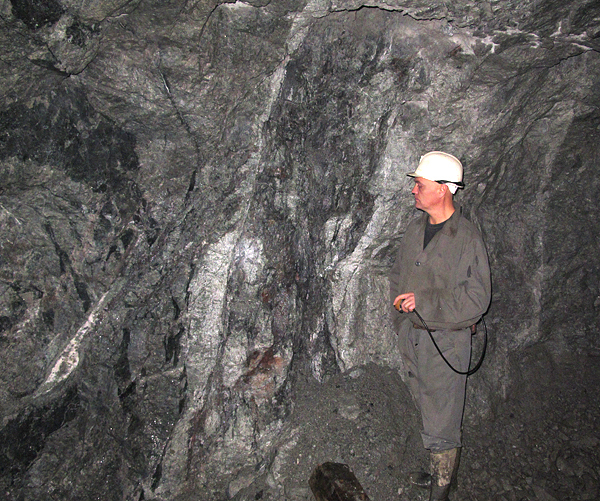 The most relevant mineralization here is given by several small metasomatic bodies. 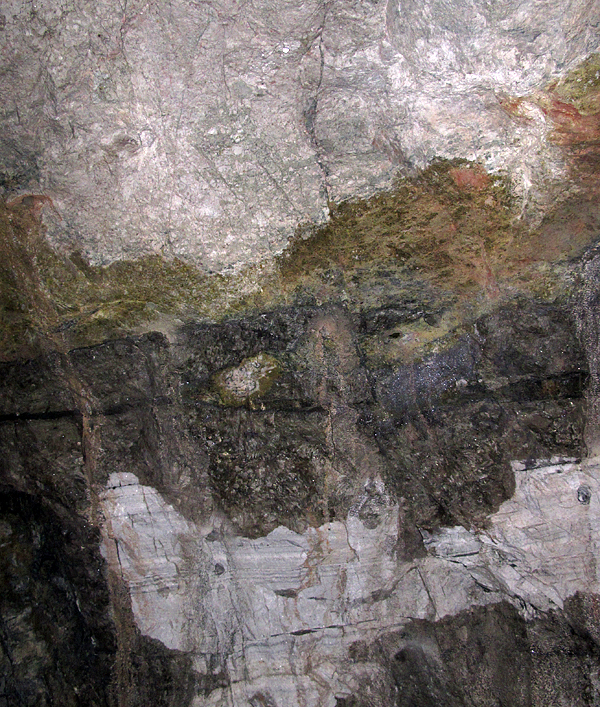 The main vein is not really impressive, and ore bodies are present where it is cross cutting the marbles. During the visit, I was able to see the horizons 0, 100 and 200. 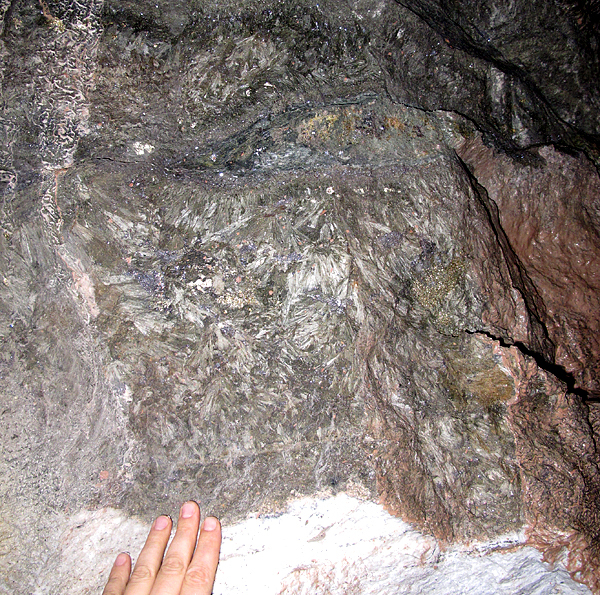 The best pegmatites were visible at horizon 100, where I collected many samples. Unfortunately, we didn`t find any major pockets worth photographing. 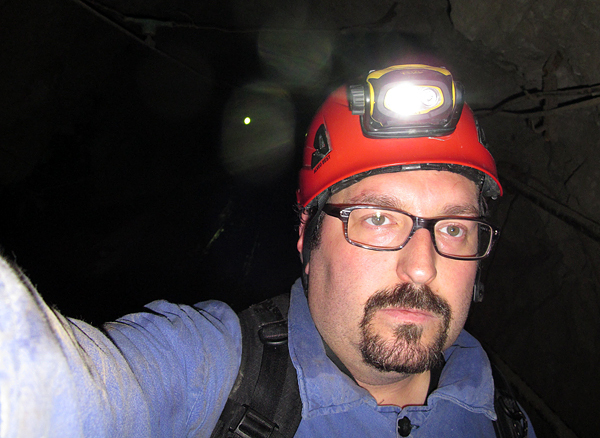 As always, the visit underground was great and I had a lot of fun. 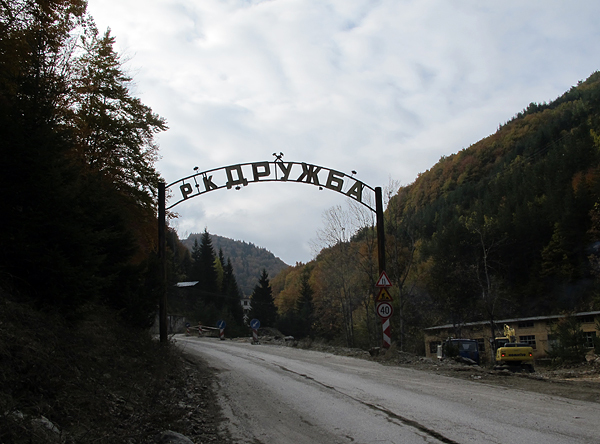 After visiting the Borieva mine, I have shortly been to the Laki area - located about 40 km N of Madan. 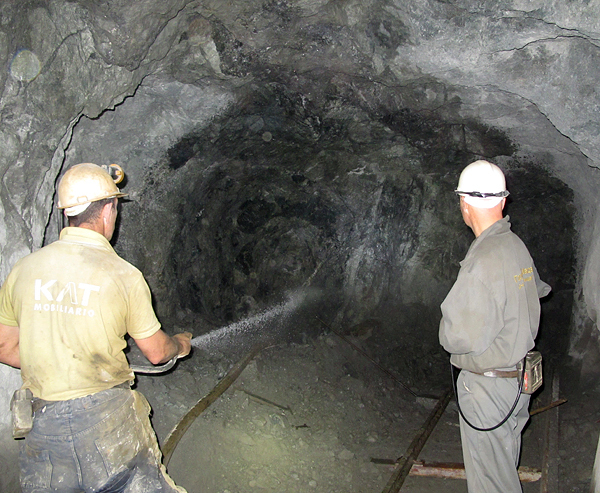 In that area, two mines are located - Drujba and Djurkovo. 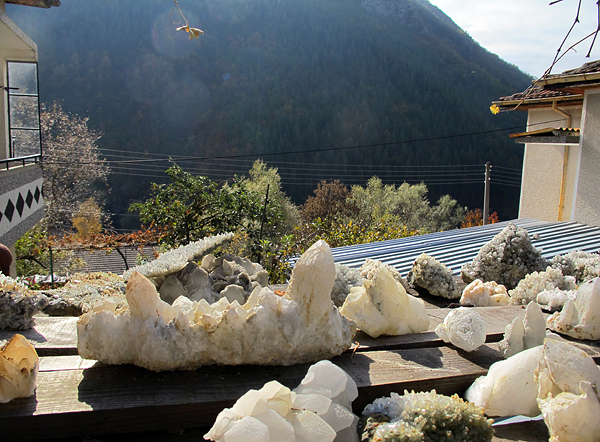 These places are famous for producing great pseudomorphs after calcite and amethysts. 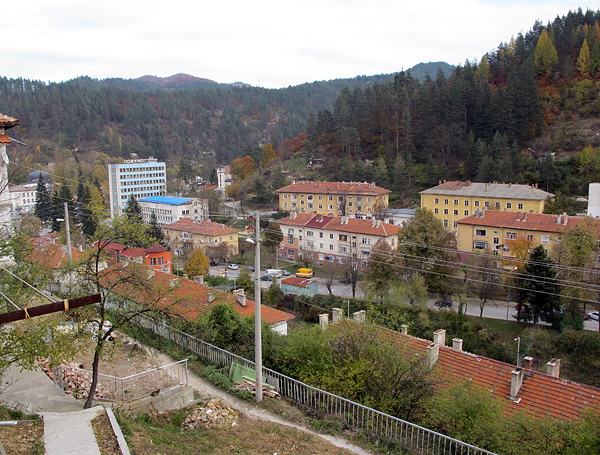 The town of Laki is much smaller than Madan, but built in the same style. 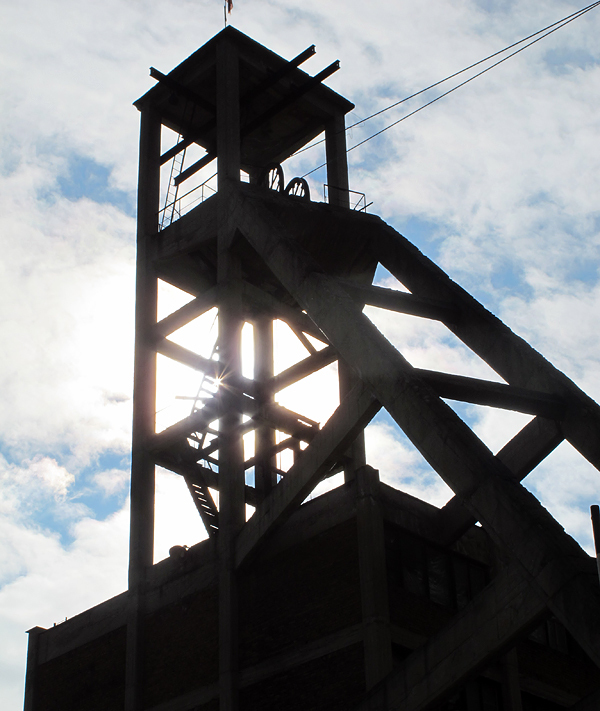 Many monuments and relicts of "great mining times" are present. 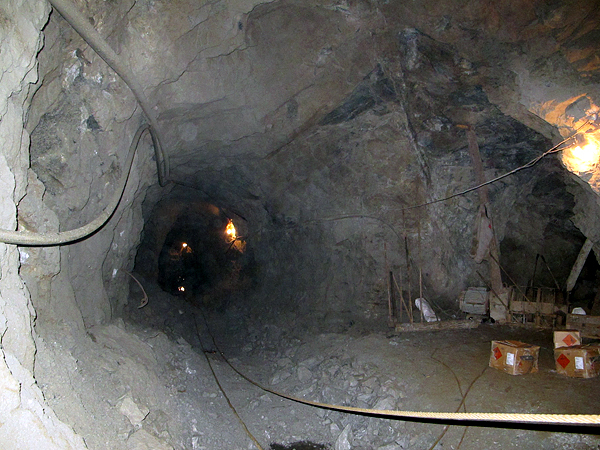 From our last trip I can say that three important new finds took place in Madan area. 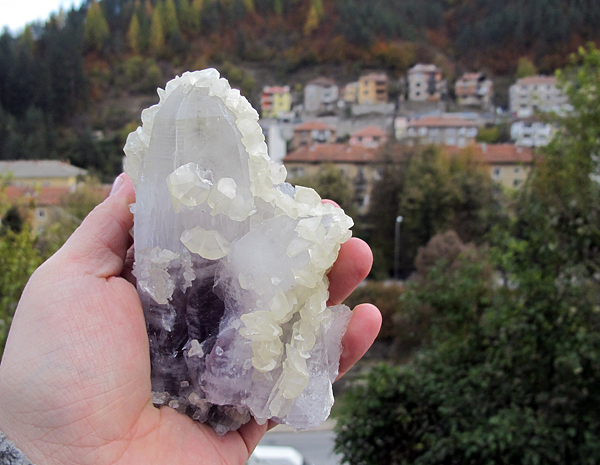 The first one was a pocket with amethyst and calcite in Borieva mine (unfortunately, already gone when I visited the mine). Amethyst is very rare outside Laki area, and the newly found specimens were quite attractive. 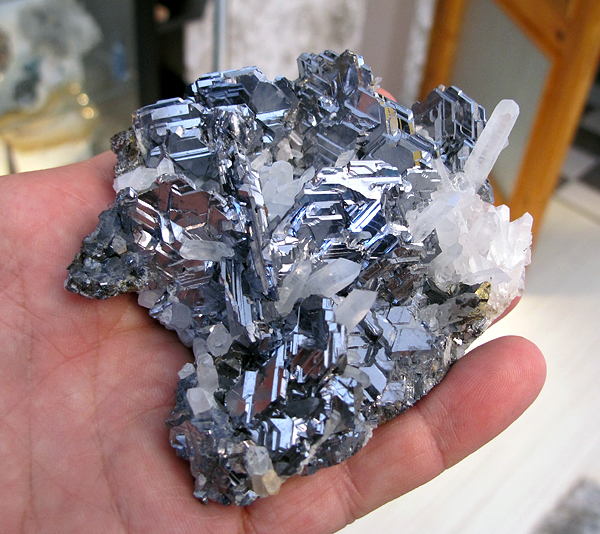 They were constituted of many clusters and/or single crystals, up to 10 cm in size. 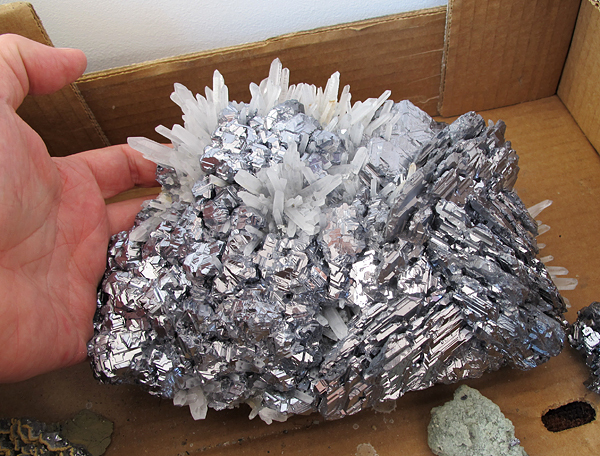 Crystals were lustrous, however the color is not very intense - just slightly amethyst in the upper parts of the crystals, and more intense in the lower parts. 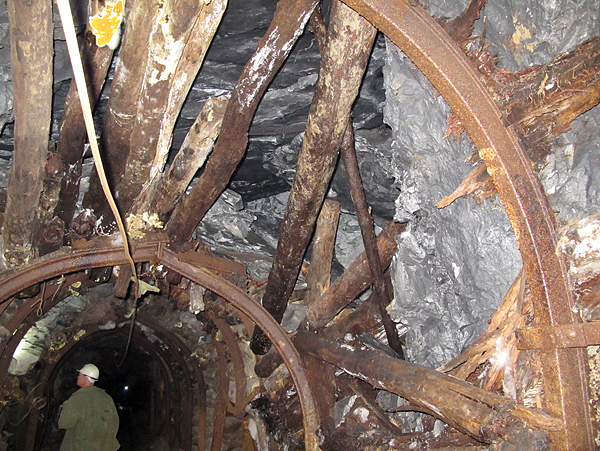 The second and third find took place in the Krushev Dol mine. 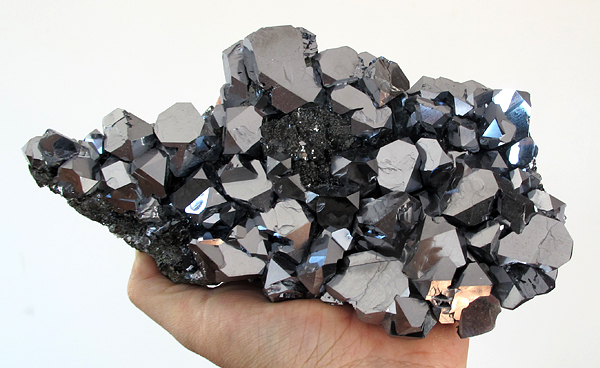 Probably the most important was a small pocket with a few dozens of specimens of white quartz with sharp, extremely lustrous galena spinel law twinned crystals. 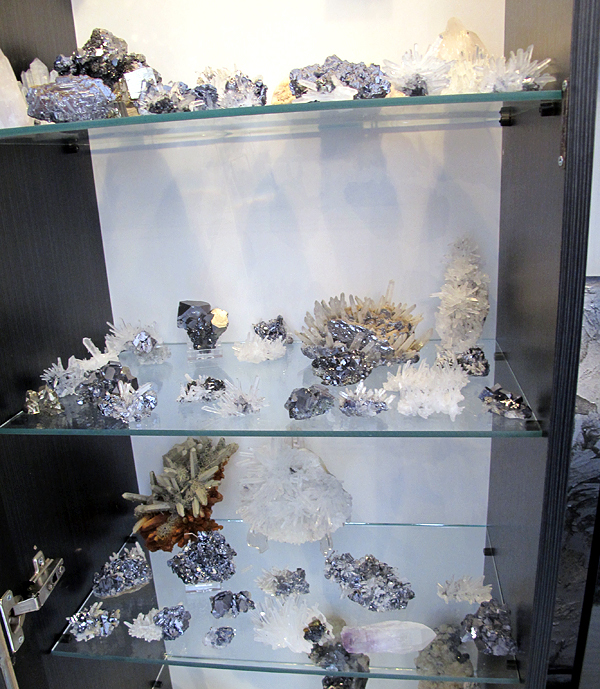 Many of those specimens are very showy and aesthetic. Unfortunately, the pocket collapsed and the majority of the specimens was destroyed or damaged. 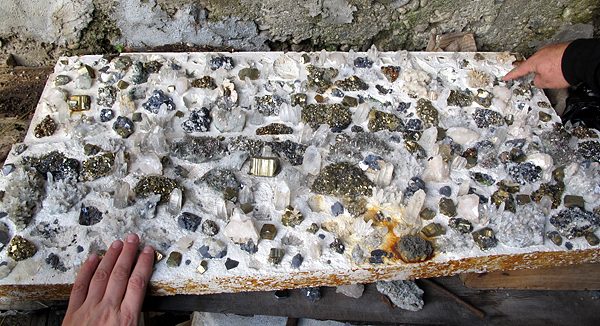 The last find was quite a big pocket of small quartz crystals with frequent very lustous chalcopyrites - also not too big (up to 2 cm) - and pyrites (up to 3 cm) with minor sphalerite. Those specimens are very colorful as for Madan, and very lustrous as well. Special acknowledgements to Chris Mavris for his help with linguistic corrections. 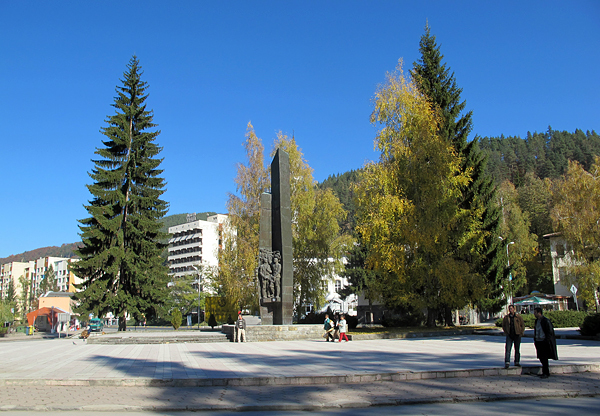 Main square in Madan town. T. Praszkier photo. 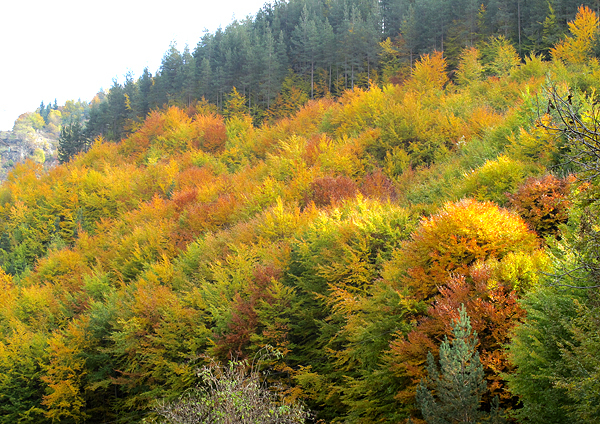 Beautiful colors of forest in autum in Madan area. T. Praszkier photo. 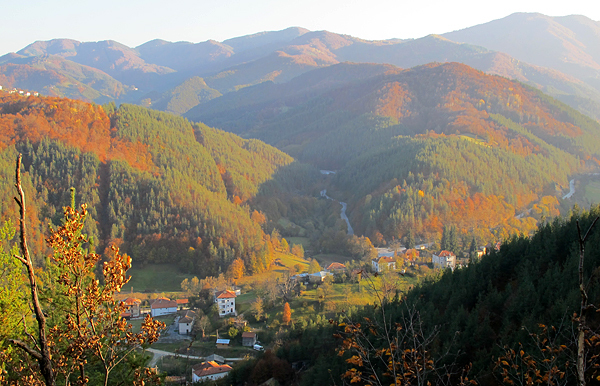 Beautiful colors of forst in autum in Madan area. T. Praszkier photo. 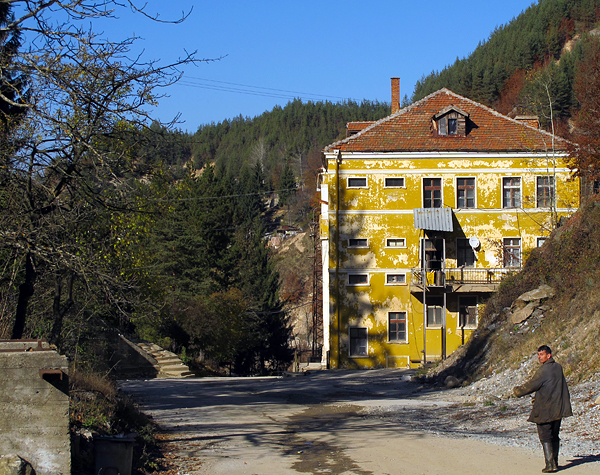 Mine Verba which will be reopened in next years. T. Praszkier photo. 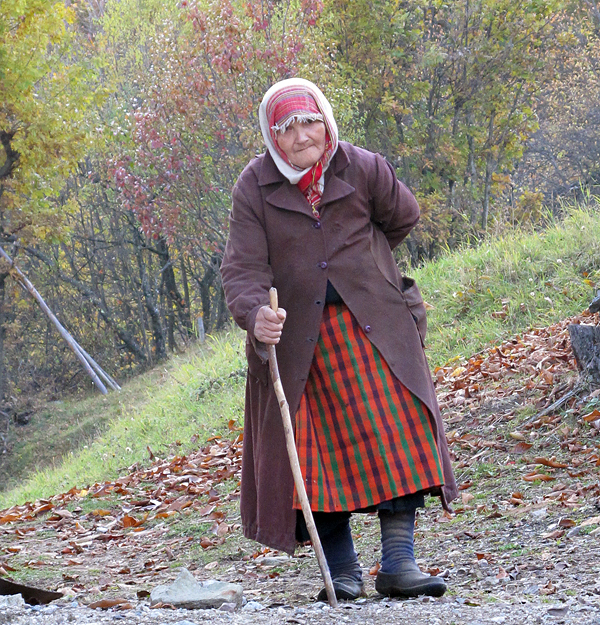 Elder woman in the mountains. T. Praszkier photo. 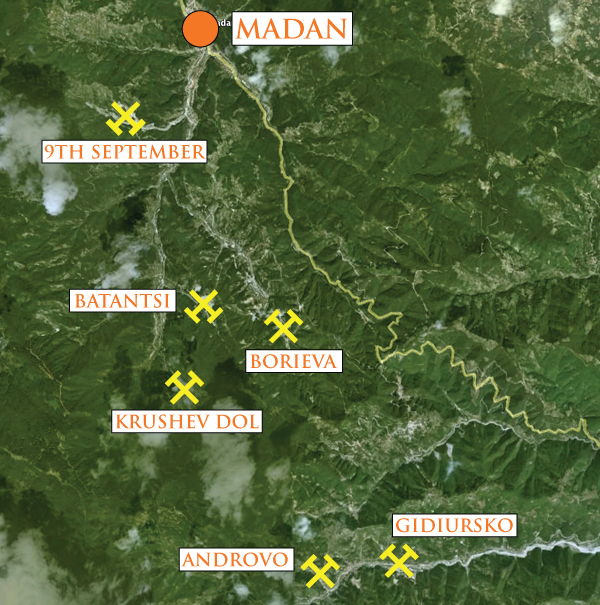 Map of Madan area with the most important mines. 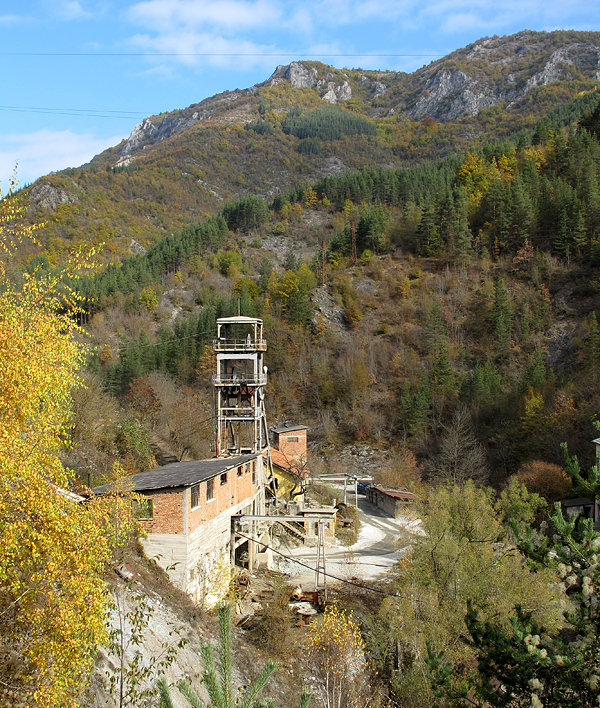 Note location of Borieva mine. 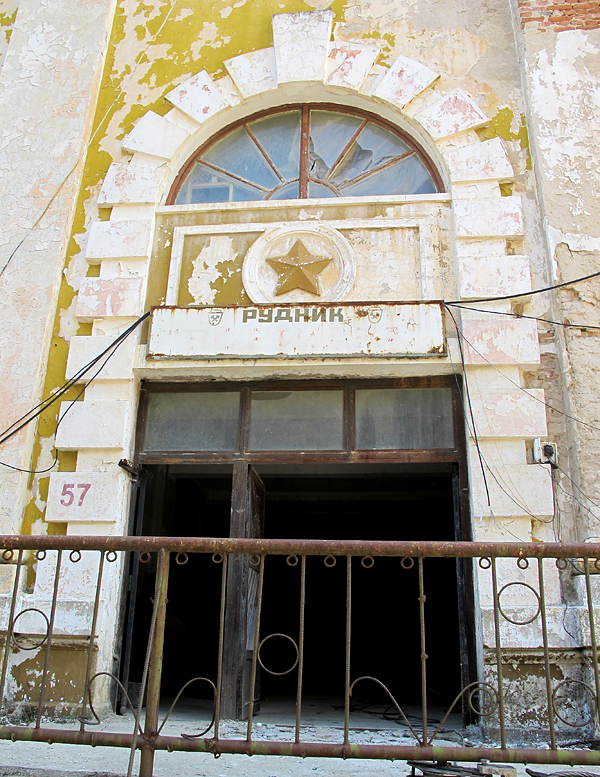 Entrance to the main office of Borieva mine. Red star is a relict of comunist times. T. Praszkier photo. 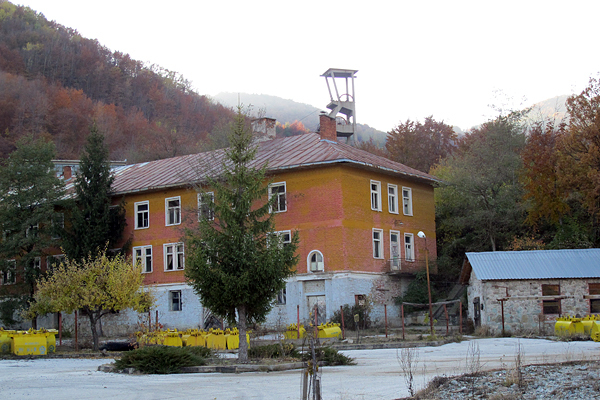 Main mine building. T. Praszkier photo. 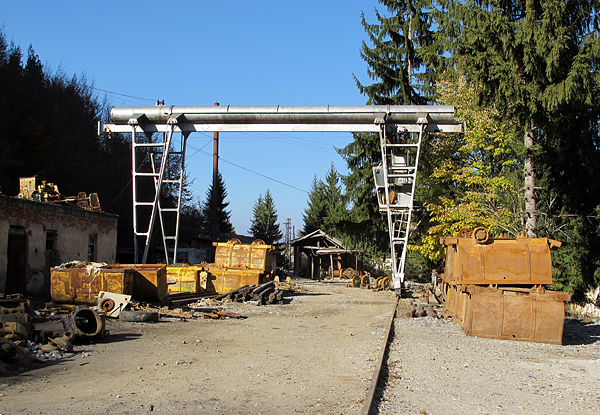 Mine "yard". T. Praszkier photo. 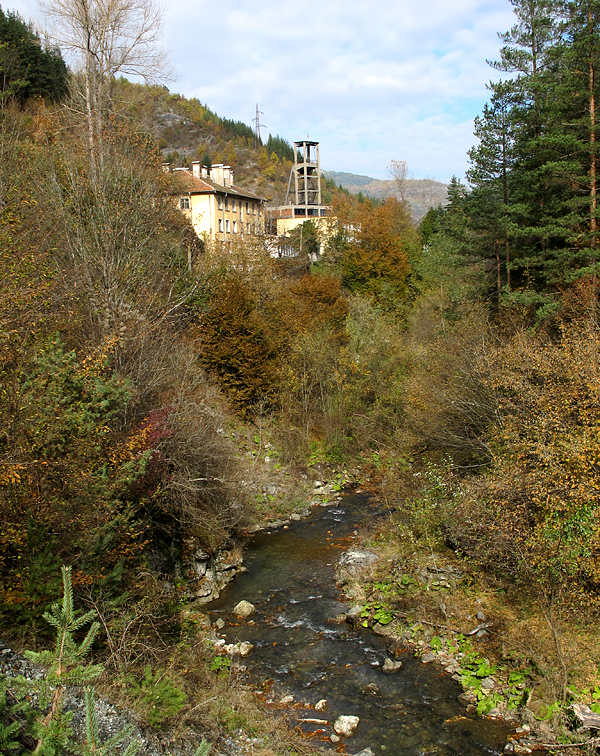 Small spring at the entrance to the mine. T. Praszkier photo. We go in! T. Praszkier photo. 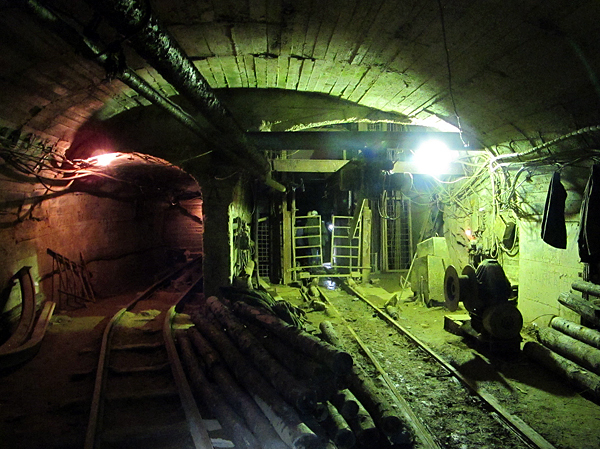 In the mine tunnel. T. Praszkier photo. Waiting for the lift. T. Praszkier photo. Drilling holes for explosives. T. Praszkier photo. 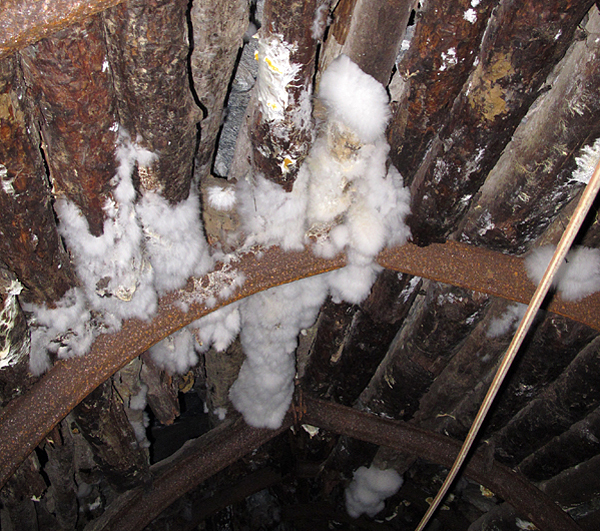 Fungi growing on wooden sealings of mine tunels. T. Praszkier photo. Transport of ore carts. T. Praszkier photo. We wait for the lift to go to level 100. T. Praszkier photo. Old wooden ceiling, partly collapsed. T. Praszkier photo. Interesting structures in marbles. T. Praszkier photo. 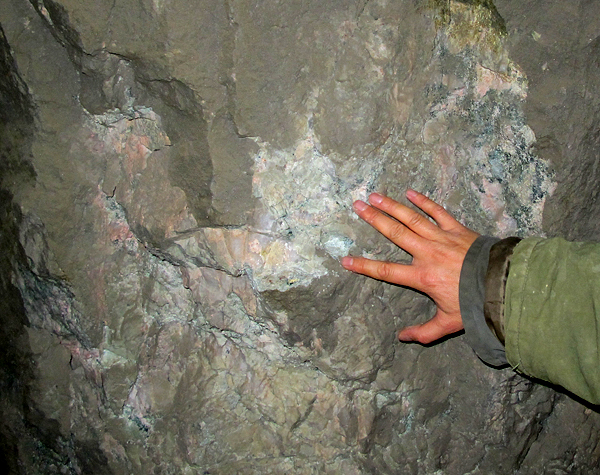 Pegmatite body! T. Praszkier photo. Johansenite-rich rocks. T. Praszkier photo. 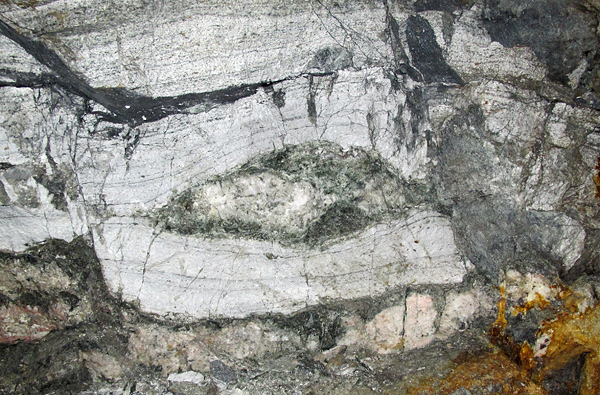 Very interesting contact zone - white marbles surrounded by metasomatic zone (dark green) and pinkish pegmatite at the top. T. Praszkier photo. 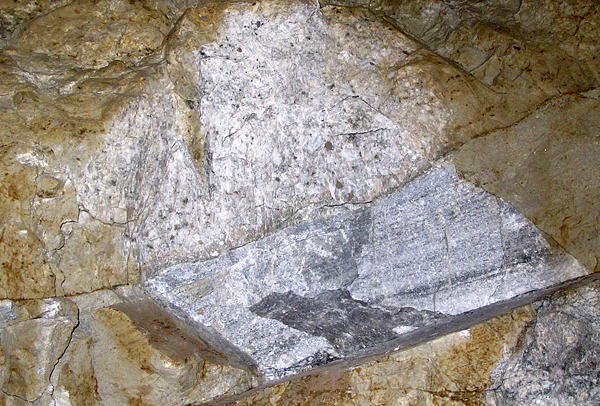 Very sharp contact of pegmatite with marble. T. Praszkier photo. Work in progress. T. Praszkier photo. 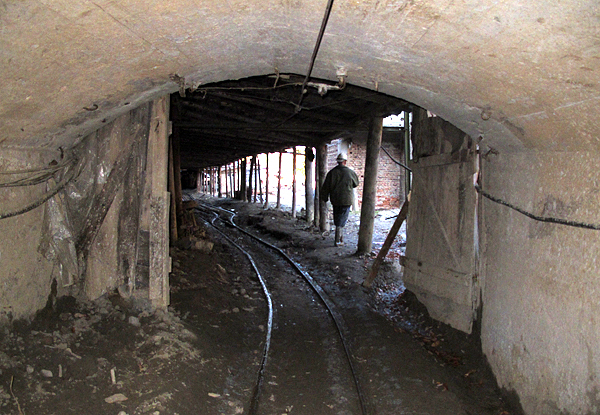 Tunnel with explosives ready to be used. T. Praszkier photo. 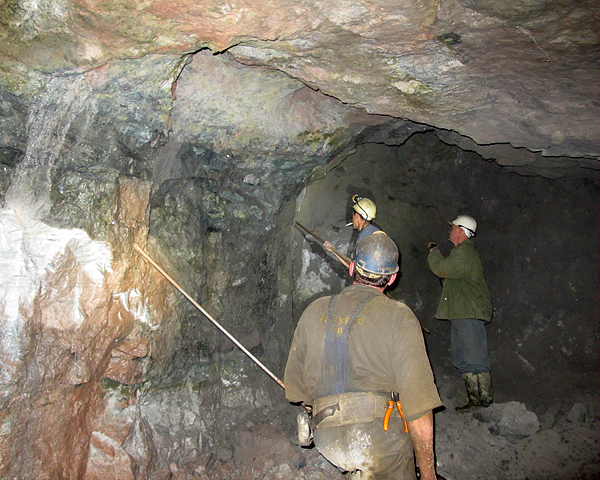 Washing mine wall to show the main ore vein. T. Praszkier photo. 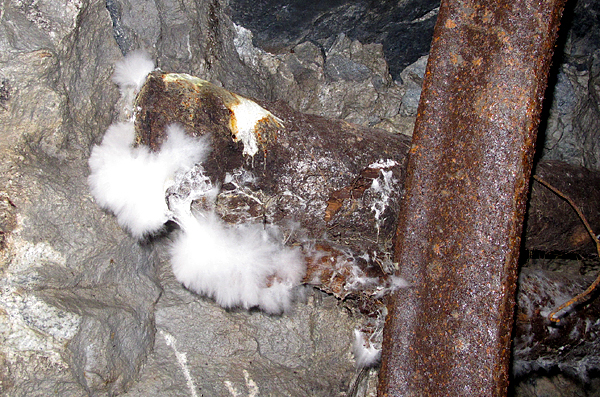 Vein in the front of the mine. T. Praszkier photo. 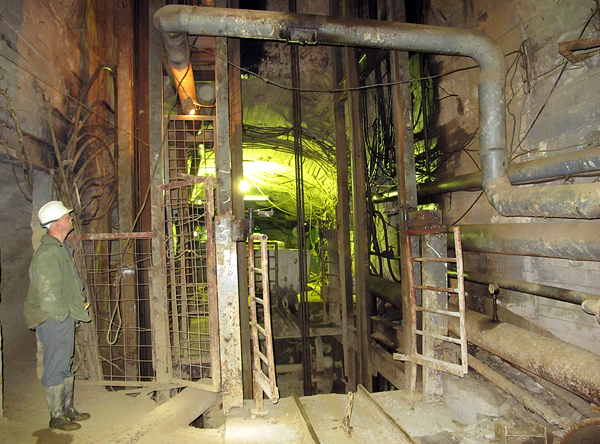 Waiting for the lift to go up to the surface. T. Praszkier photo. Tired but happy. T. Praszkier photo. Coming back to the sunlight. T. Praszkier photo. 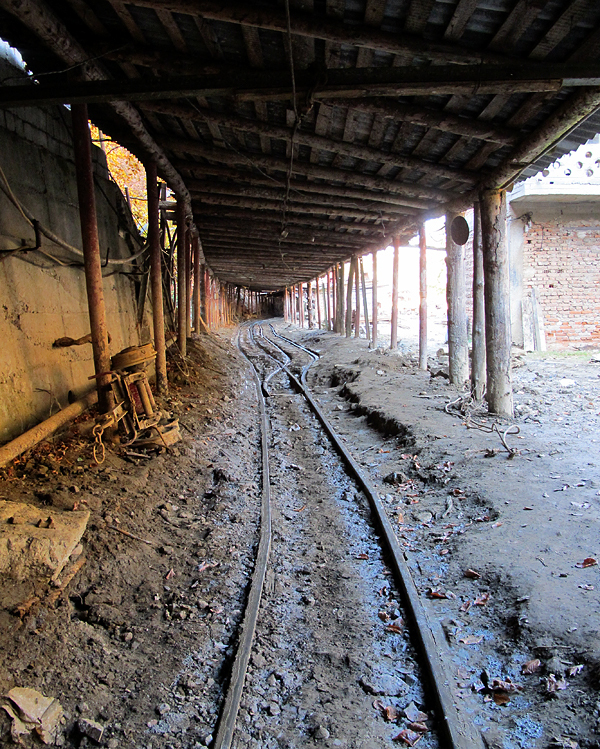 Railway tracks for the mining carts. T. Praszkier photo. Landscape on the way to Laki. T. Praszkier photo. 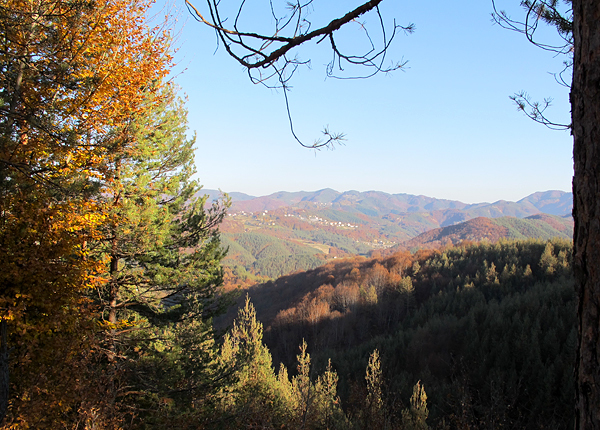 Superb colors of forest in autum on the way to Laki. T. Praszkier photo. 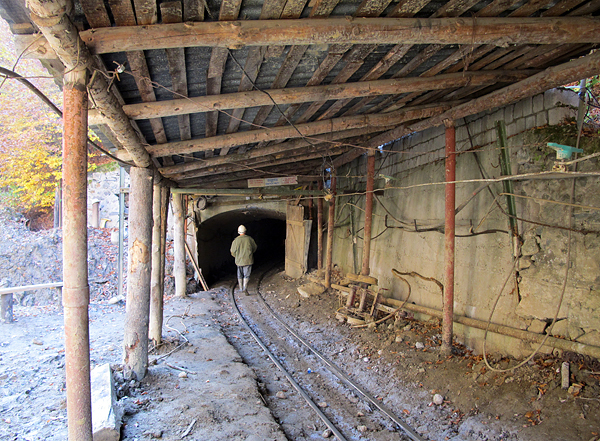 Gate to mine Droujba in Laki area. T. Praszkier photo. 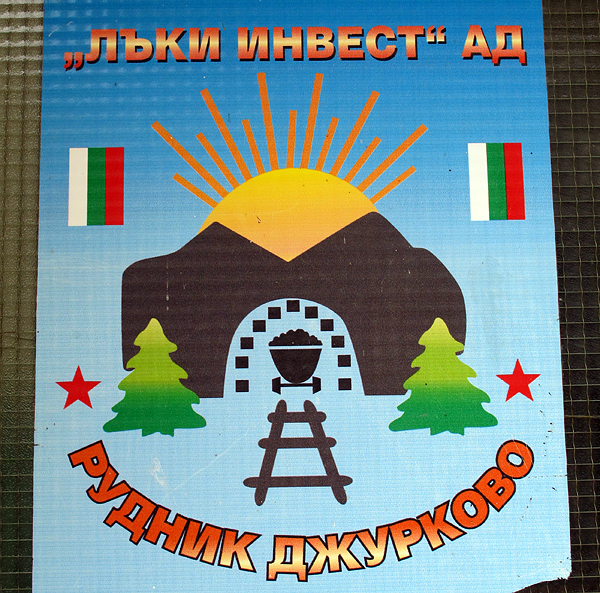 Logo of Djurkovo mine. T. Praszkier photo. 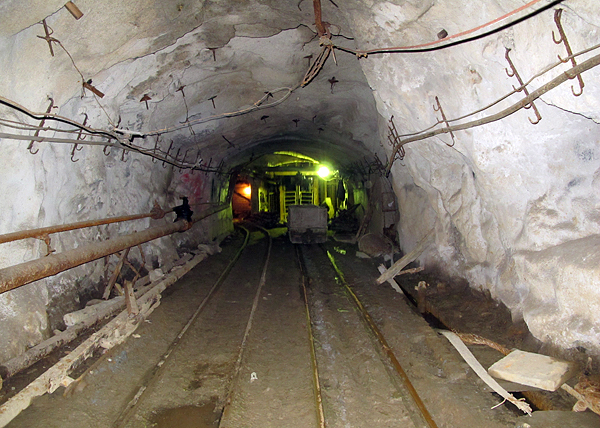 Djurkovo mine. T. Praszkier photo. 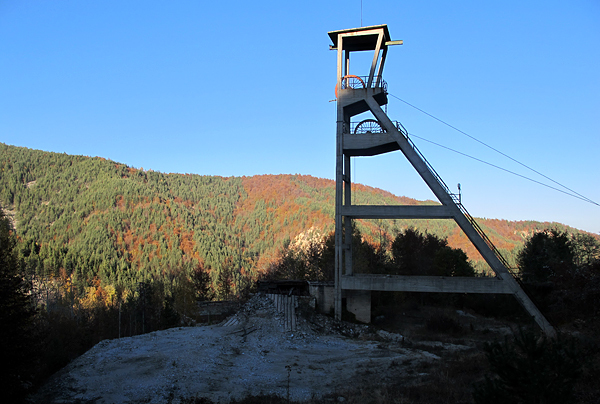 Djurkovo mine headframe. T. Praszkier photo. 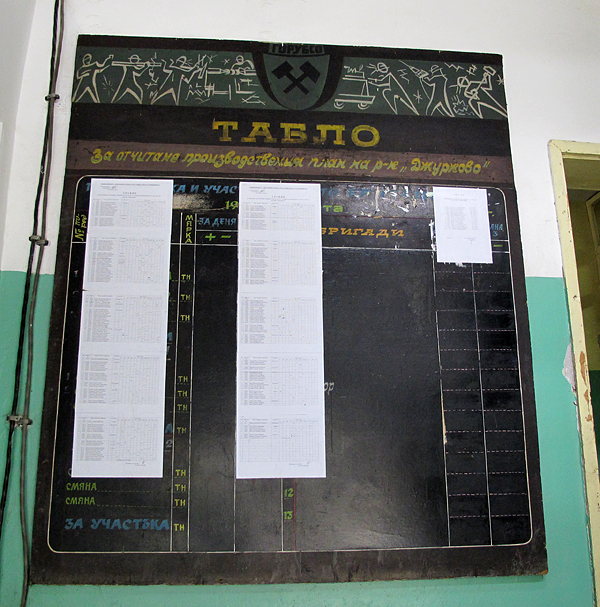 Board with work schedule. T. Praszkier photo. 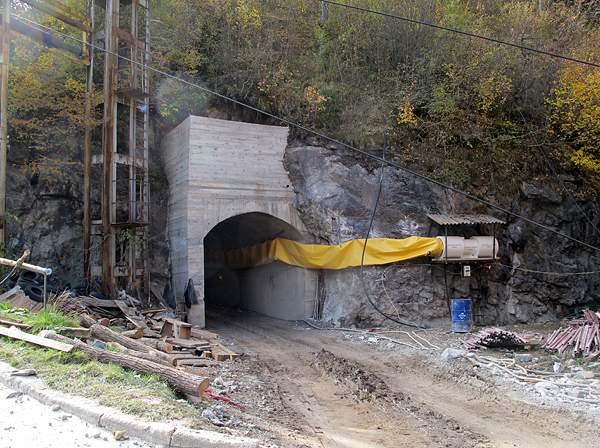 New tunnel under construction! T. Praszkier photo. 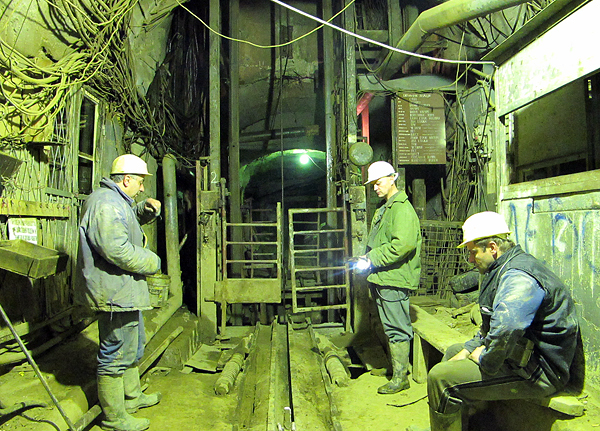 Transportantion shaft in Djurkovo mine. T. Praszkier photo. Laki town, note ore cart in the town logo. T. Praszkier photo. 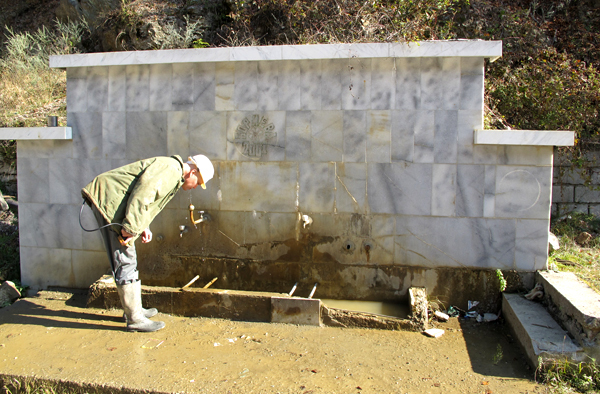 Laki is placed in very picturesque area. T. Praszkier photo. 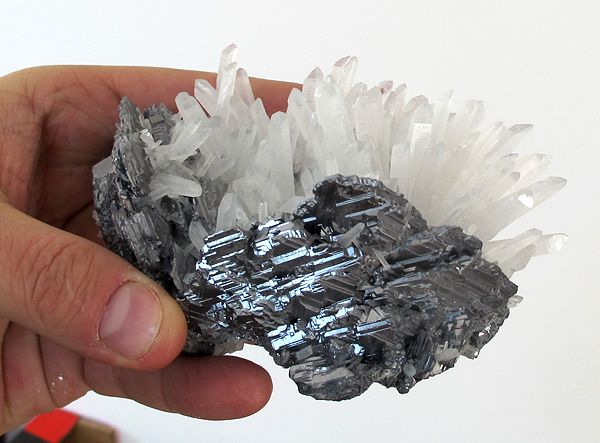 Quartz from Laki area. T. Praszkier photo. 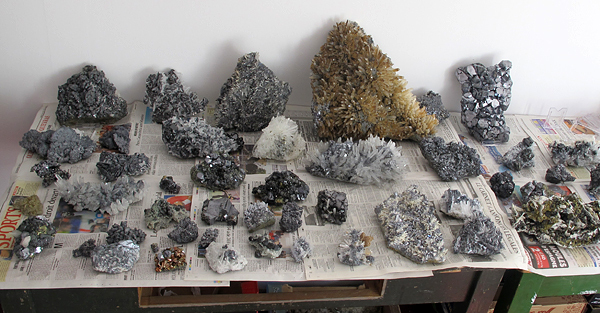 Gypsum plates with Bulgarian sulphides. T. Praszkier photo. 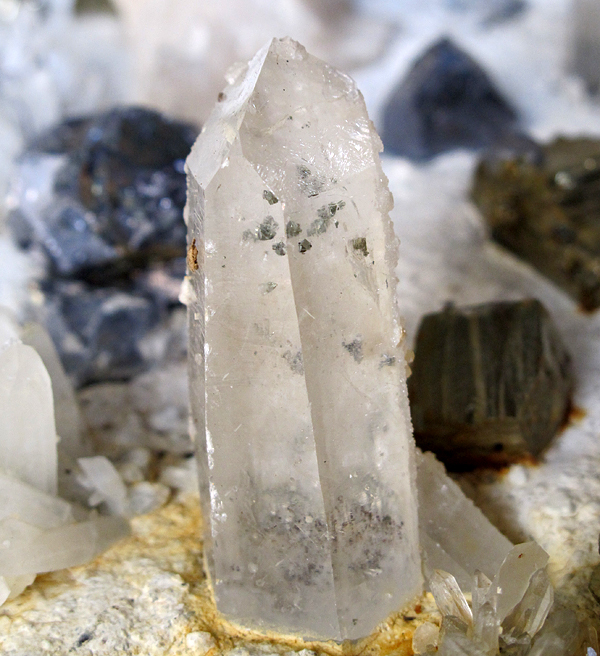 Quartz with chalcopyrite inclusions mounted in gypsum. T. Praszkier photo. 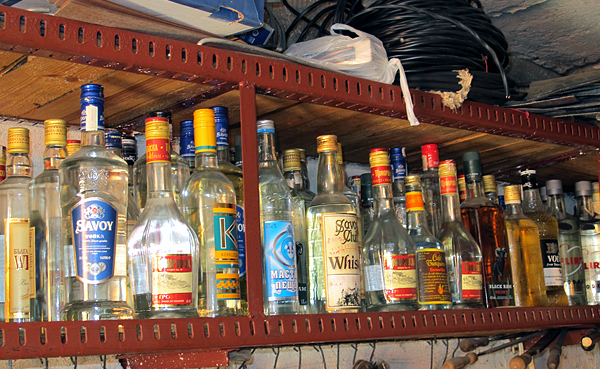 Home made rakija in the miner`s garage. T. Praszkier photo. 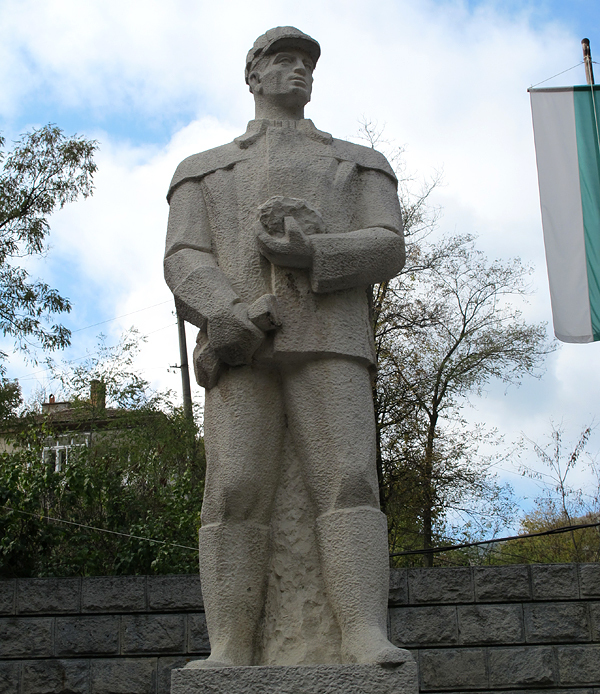 Socialist-realism monument of miner with ore in his hand in the center of Laki town. T. Praszkier photo. 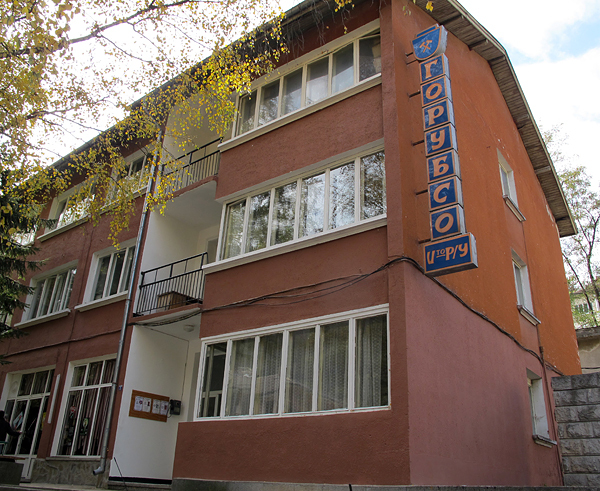 The main office of mining company in Laki. T. Praszkier photo. 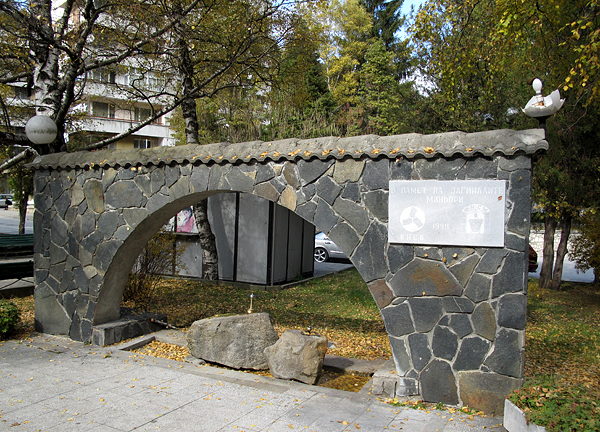 Monument in Laki center with text "In the name of lost miners". T. Praszkier photo. 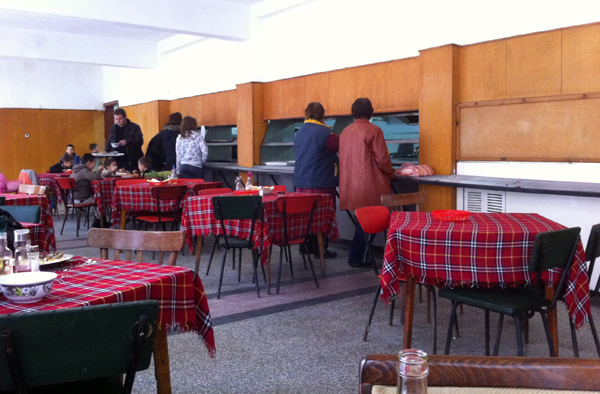 Old style miners canteen - very simple but you can buy there cheap meals. T. Praszkier photo. 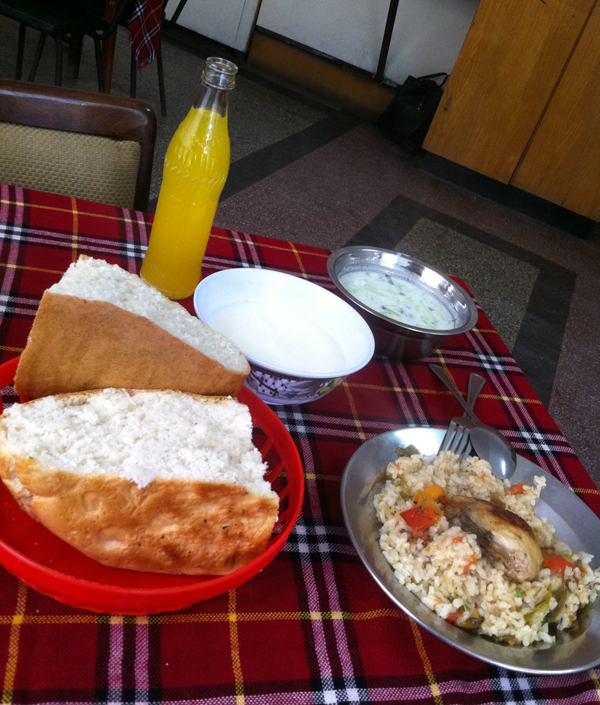 This meal cost 1,5 euro! T. Praszkier photo. Coming back to Madan. T. Praszkier photo. 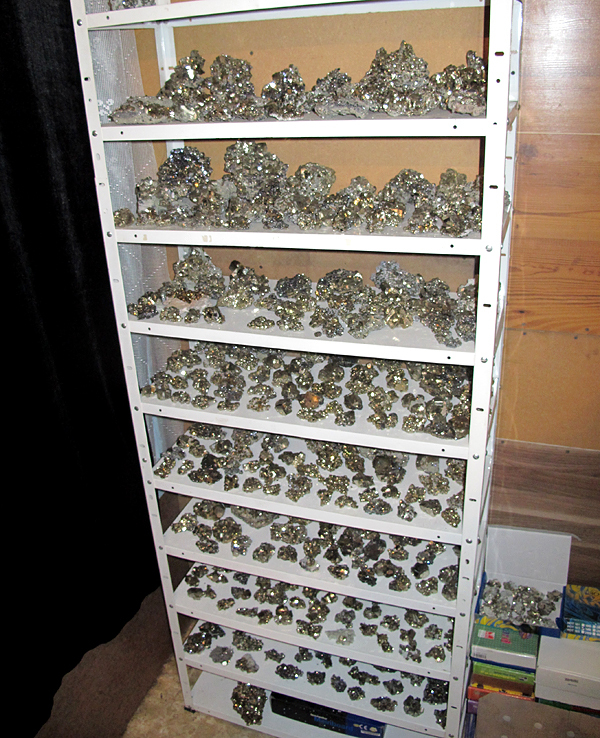 Shelf full of pyrite specimens from Gidiursko mine. T. Praszkier photo. Shelf in home of one of Madan collectors. T. Praszkier photo. New amethyst with calcite from Borieva mine. T. Praszkier photo. New superb spinel law twinned galena with quartz from Krushev Dol. T. Praszkier photo. 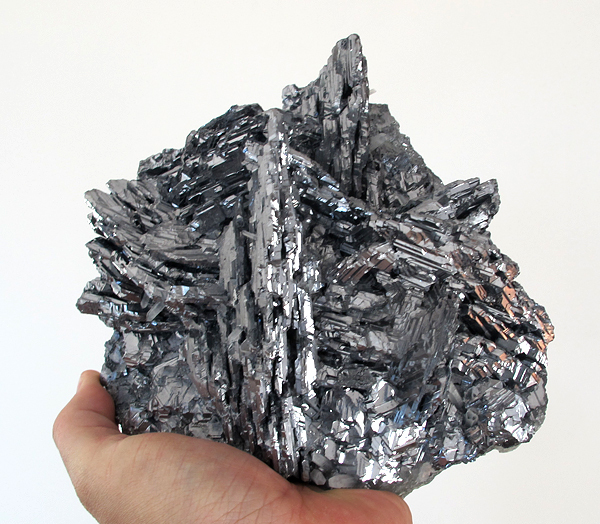 New superb spinel law twinned galena from Krushev Dol. T. Praszkier photo. 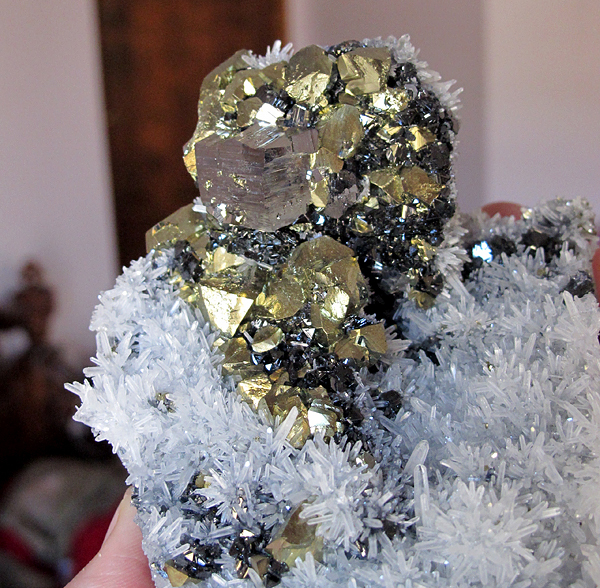 New chalcopyrite specimen found in Krushev Dol mine. T. Praszkier photo. 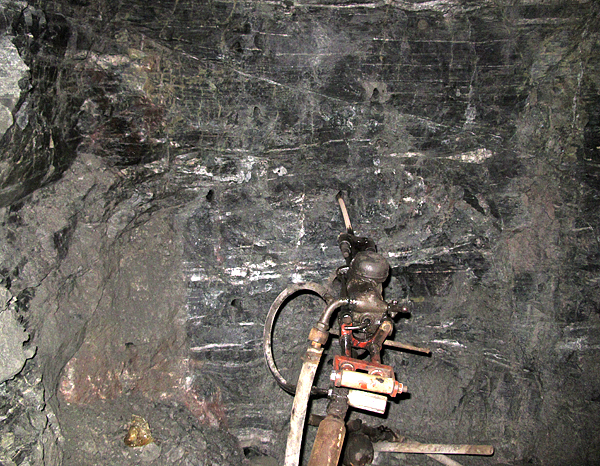 Huge specimen from Gidiursko mine. T. Praszkier photo. 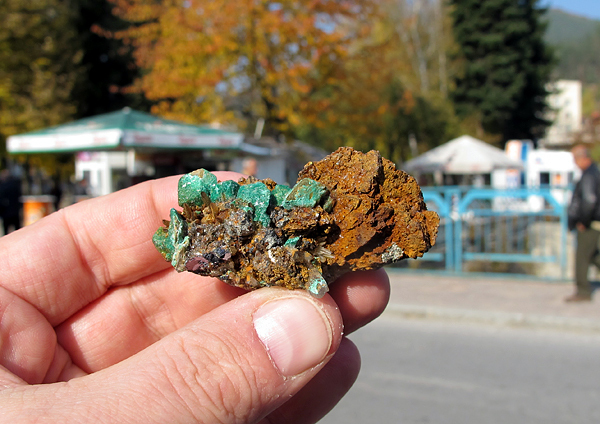 Strange coating (malachite with gypsum?) on calcite. T. Praszkier photo. 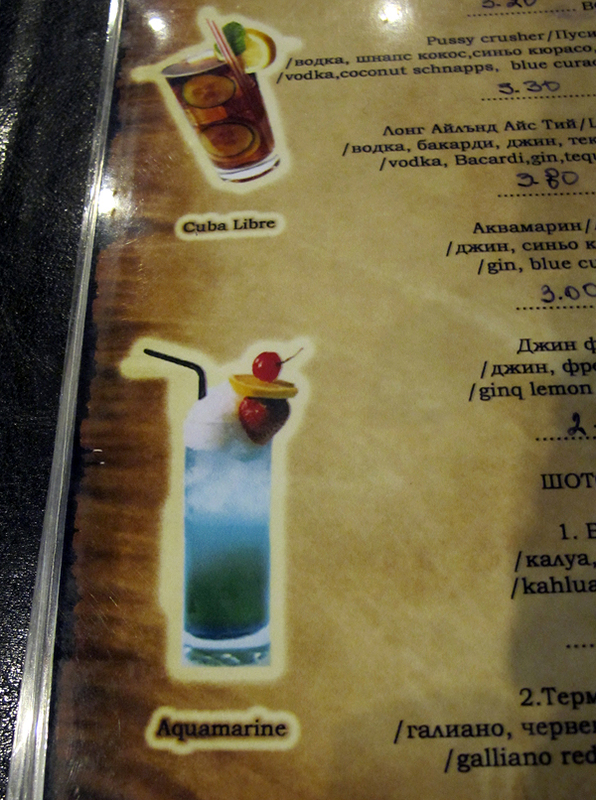 At the end drink in menu in one of Madan restaurants.... T. Praszkier photo. 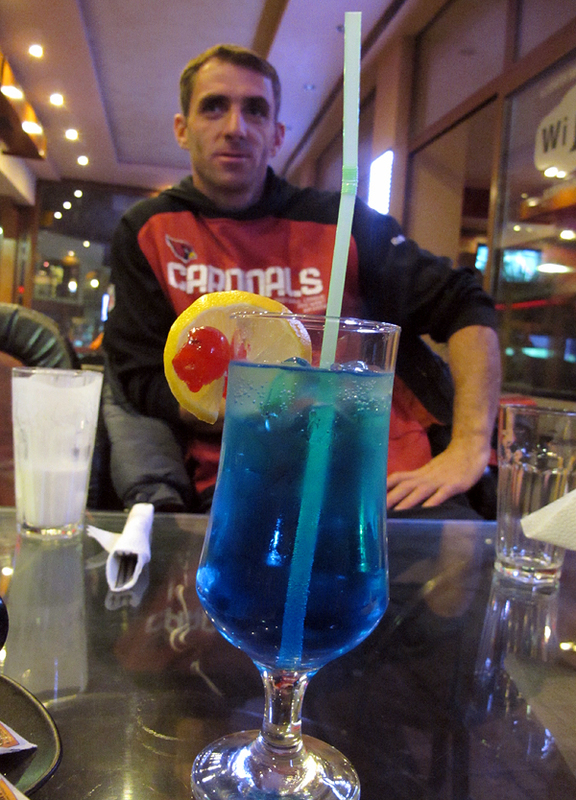 ...aquamarine drink with our Madan friend in the backgroud. T. Praszkier photo. Great report on Madan trip as always. 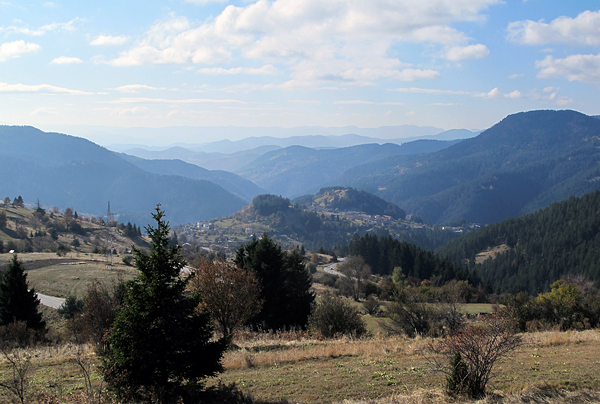 In my opinion Bulgaria is one of the most beautiful places in the world, and it gives us such beautiful sulphides sulphides. Will those spinel galena specimens be available for purchase? 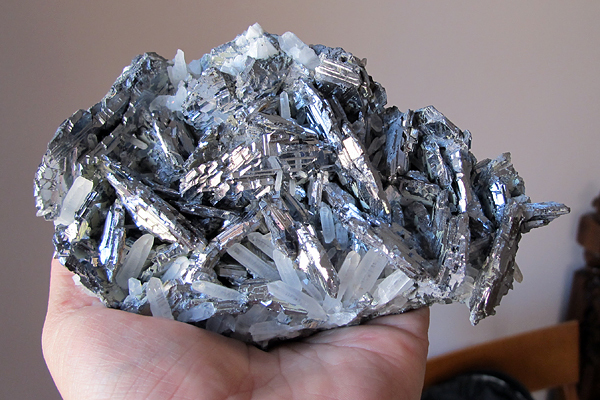 I just love Bulgarian Galena, best in the world in my view.